Purses and handbags have their origins in early pouches used to carry seeds, religious items and medicine. Early on, both men and women carried pouches. In the 15th century, a purse was a traditional gift from a groom to his bride. The bags typically were elaborately embroidered with an illustration of a love story. In New Guinea, centuries ago, both men and women carry large knit bags which looked like nets decorated with feathers, seashells and other mementos. The more shells a person had was a sign that they had many people who lived by the sea. The similarity between an haute couture tote and a satchel belonging to an African witch is that both bags hold a secret of some sort. He says bags are very personal, it holds the things you need for the day and the things you want to have, just for comfort or hobby. People began carrying items from home when the traveled, even on short trips. Items such as a deck of cards, knitting, a diary as well as beauty and personal items could be brought along. Traditional wallets began as early as the 16th century, as small leather pouches which a drawstring tie could loop through a belt. Also in the 16th century there were ‘sweet’ bags that women used often as lavender bags to scent their handkerchiefs. Pockets, called bagges were also introduced into clothes around the same time and allowed people to carry small personal belongings. By the late 18th century, women’s clothing was more form fitting and pockets ere not easily accommodated into the garment. Women began carrying small, often silk embroidered drawstring bags or purses called reticules, or ‘ridicules’. These bags often carried a handkerchief, fan, dance card, perfume, or face powder. Reticules were smaller version of what women used to carry their needlework. This is likely the origin of the Dorothy bag which has since emerged as shoe bags, dress bags, laundry bags and today, gym bags. The Victorian period brought a large variety of bags. Bags often were made to coordinate with the outfit and were now made of many different fabrics. By the mid 1800’s, bags changed from simply drawstring styles, to a popular flat style, that could be made in either a circular or square shape and was generally heavily decorated with beading and needlework. Patterns and directions for making these types of purses became popular in ladies magazines at that time. There were also smaller versions, used as coin purses which often included a metal fastener. 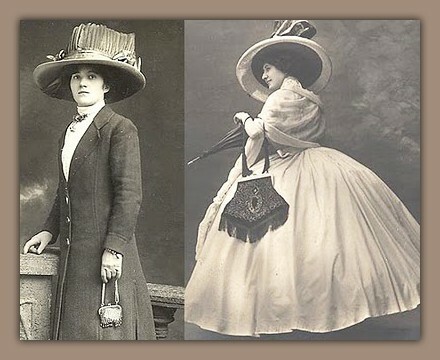 By the early 20th century, women were carry bags every time they left home, even for short periods while hats were popular accessories that began to loose popularity by the early 20th century, handbags became increasingly popular. The success of the handbag has much to do with the fact that it has adapted to the needs of the time. Handbags held cigarettes, sunglasses rather than seeds and medicines. Years ago, it was ladylike to carry as little as possible. A small bag was typical. Today women are gone form home for longer periods of time, frequently working or if not, often with children along . The size of the typical bag has increased to meet the need. Eleanor Roosevelt is noted as a sing of the time as a very busy and active woman herself, she carried a large leather handbag not necessarily typical of the time. Shoulder bags became popular during World War II and twentieth century technology opened up a variety of new f textures and materials from synthetics to hand-woven straws. Casual bags were made in rain proof materials and special tote bags for the beach developed. 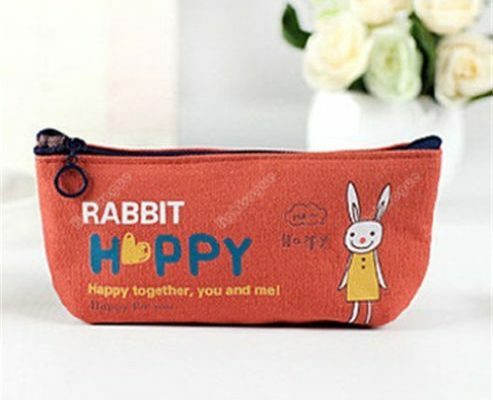 The variety of fabrics carried over to all hand bag designs and it has become common place for women to have many handbags, to meet the need of the occasion. It became fashionable for men to carry bags during the 1970’s though they were generally hobo style casual bags and even today, while it is not unusual to see a man with a messenger bag, hobo or some other form of tote, it is surely not common place. Coach began as a family run business in a Manhattan loft. The company started with just a handful of artisans who made high-quality leather goods. The founder of Coach was influenced and inspired by a baseball glove when which he knew got softer after use, thought he leather retained its beauty. The glove-tanned leather continues to be used by Coach. Coach began with twelve simple bag designs, focusing on classic designs for handbags. In 1988, Coach noticed a decline in sales as a more eclectic fabric and mixed material bag became popular. Coach at the time, was vowed by women as making more traditional and conservative design. In response, Coach made some changes to the design and began using more fabric and developed the signature “C” print. That change as very successful and Coach continued to grow and develop new designs. The company has since expanded to include briefcases, planners, computer cases and a travel collection. In 1985, the Sara Lee Company purchased Coach and in 2000 the company went public. Coach has found that some of the expansion and newer designs have not been well received by some of the older loyal customers. A move back to the classic handbag began recently to address this concern. Gucci Gucci began his leather goods company in Florence, Italy in 1921. He was very influenced by the years he spent working in England before returning to Florence to open his own company. His equestrian-inspired detailing such as the horse bit and stirrup motif came from the English influences and became a long time symbol for Gucci. The label was very successful. In 1947, the company introduced the bamboo handle which has remained popular. In the 1950’s, the trademark green-red-green became very successful and remains one of the most familiar identifiers of the brand. Gucci expanded and Stores opened in Milan, NY, London, Palm Beach, Paris and Beverly Hills. In 1953, Guccio Gucci died in 1953, and his son’s Aldo, Vasco, Ugo and Rodolfo took over the business. Some of the best known Gucci designs include the “Jackie O” Gucci shoulder bag. The Hobo bag became popular in the 1960’s with celebrities such as Liz Taylor and Peter Sellers wearing them. The classic Gucci moccasin with horse bit hardware became a part of the permanent collection at the Costume Institute, Metropolitan Museum of Art. The interlocking double G logo was adopted by Gucci in the 1960’s. In 1982 Gucci became a public limited company and in1995 Gucci became a fully public company. Gucci was named “European company of the year in 1998 by the European Business Press Federation. Today, Guicci is recognized by a variety of details including, gold hardware for simple understated luxury, braided or chain straps for added distinction, accents such as tassels, charms, or studs, detachable shoulder straps. Flap or top closures with either zippers or magnets for security., a sturdy bottom feet to support larger bags, interior and exterior pockets and of course the signature interlocking double G logo. Prada is an Italian company founded in 1913 by Mario Prada. His granddaughter, Miuccia inherits the company in 1978, at which time it was still a leather goods business. She has led the company to huge expansion. Prada has 14 locations in the U.S. Prada acquired Rome-based Fendi in the early 1990s.but later sold its shares to the Moet Hennesy Louis Vuitton (LVMH) Company. Prada has developed a newer, slight more affordable line called, Mui Mui after Miuccia Prada which is targeted toward a younger market. Prada purses are know for their sturdy, functional, and yet fashionable design. Handbags often include leather, fur trim, gold and silver hardware, contrasting stitching, magnetic snap closures, zippered inner pockets and detachable identifications tags or key rings. Of course the Prada logo plates always displayed. Prada purses typically come in neutral colors that emphasize practicality. They occasionally offer bolder prints and patterns. Louis Vuitton began as a trunk manufacture in Paris in 1854,. Luggage continues t be a major market today for the company. The design is well known and recognized with the familiar beige and brown LV monogram. The Vuitton line gained international When Louis Vuitton died in 1892, his son, Georges, took over and expanded the company, developing, developing what is recognized as the first “designer label” on a product. The company’s monogram canvas design was created in 1896 by Vuitton’s son Georges and was intended to prevent counterfeiting. However, , Louis Vuitton has become the most counterfeited brand in fashion history. It is estimated that just over 1% of all items with the Vuitton brand name on them, are actual Louis Vuitton’s. The rest are counterfeit. What started as Vuitton’s luggage company has become a world leader in luxury goods. In 1936, after Georges died, his son, Gaston-Louis, took over the company. Vuitton merged with Moët-Hennessey in 1977 and became LVMH. Ten years later, in , 1987; LVMH bought Givenchy .In 1998 Vuitton joined with designer Mac Jacobs and expanded the company further into the high fashion market. Fendi began as a leather and fur workshop established by Adele Casagrande in Rome, in 1918. When she married, she changed the company name to that of her husband. Fendi, like many of the luxury companies, has been a family run and owned business. Today, the company is run by the five daughters of the Fendi’s. They became involved with the business after the death of their father in 1954. The Fendi daughters moved the company from fur and leathers, to a high fashion profile. In 1999 Fendi was bought by Prada-LVMH. Over the decades the Fendi became more and more popular, and is now known worldwide. Fur continues to be a major market for Fendi. Today, a woman without her handbag feels at a loss. A woman’s handbag continues to hold her own personal tastes and her secrets. Handbags are so personal, that it is clearly understood that one just does not look into another person’s handbag. The handbag, and the fact that male handbags never quite caught on, remains a huge difference between the sexes. Men continue to carry everything in their pockets, and men’s clothing, unlike women’s always has pockets. A man wearing a suit and overcoat can easily have ten pockets at his disposal while women in a suit and a jacket might have none, or only a couple shallow decorative pockets. Women need the handbag. Some psychologists think that the way a woman carries her bag is characteristic. 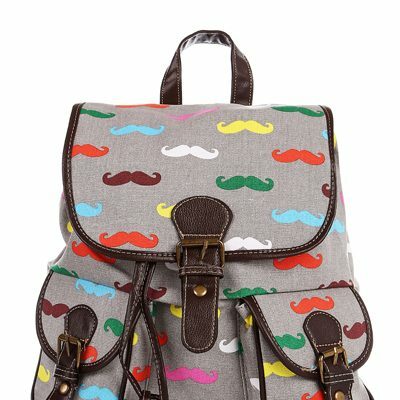 The term “bagology” was coined in a 1940’s newspaper article on handbags that attempted to explain he science t men. The article claimed that, the way a woman carriers her purse tells a lot about her. Handbags do say a lot about a woman .Just as you can tell a lot about a person from their clothing, you can also tell a lot about a person simply from the handbags they carry. Under-the Shoulder – Handbags which are smaller and fit tightly underneath the shoulder indicate class and sophistication. 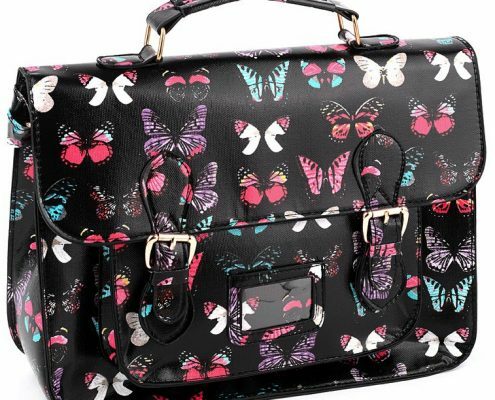 A women working in an upscale office or someone of high stature would choose this form of handbag. Big and Bulky – Big, bulky and oversized bags are casual and are often associated with younger individuals. These are used for individuals who carry a number of things (binders, books etc) and require a lot of space. Down-to-earth, lower-maintenance women would carry this type of handbag. Designer – Designer handbags often cost an arm and a leg and therefore are usually associated with high-maintenance females. Females who are confident and require top of the line accessories will settle for nothing less than a name-brand designer purse. Guys – watch out for these girls, they tend to be a handful. Cigar Box Purses – A women who carries a cigar box purse likes to be unique and stand out from the crowd. These women have minds of their own and cannot be told what to do. They are comfortable in their own skin and tend to be very independent. Leather with Buckles and Zippers – Women who choose leather purses with lots of buckles and zippers are leashing out their wild sides. These women tend to act before they think and are always ready for a good time. The extra buckles and zippers tend to signify a “bad girl” image. Bright Colours – Bright coloured handbags like pink, purple, bright blue and green indicate that the woman is fun, friendly and approachable. Women who are out-going and sociable will tend to choose these colors. This is the type of woman who will strike up a conversation with a complete stranger. Black and Brown – Women who choose black or brown handbags tend to be more reserved and are often mistaken as being snobby or restricted. 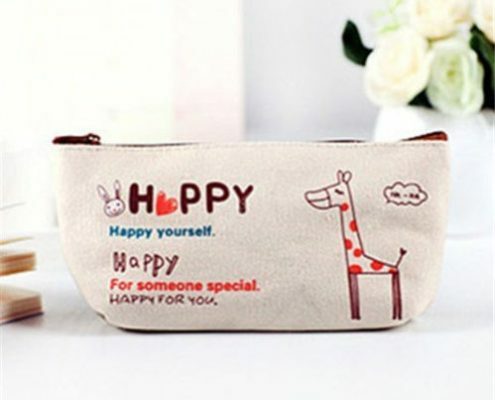 These types of handbags are often associated with down-to-earth women, who are shy at first, but open up after a while. They tend to exude a shy confidence, which is sometimes mistaken as someone who thinks she’s better than others. The Envelope – also as the name implies, is shaped like an envelope and is a popular, basic purse that is smaller, neater and feminine, often used for more formal occasions thought these are available in casual designs also. The Hobo Bag – traditionally, is a casual design that can be carried by both women and men. Hobo is now an actual brand name. The Clutch – a small, square bag like large wallets and is often used as evening bags. 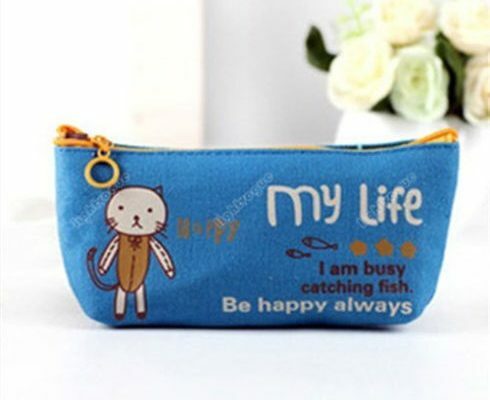 These are generally small bags, so just hold the absolute necessities. The Shoulder Bag – It has of course, a longer strap so the purse can be hung on the shoulder. This design is hand for everyday as it allows you to keep your hands free for other things. The Shopper Style Bag – is a big bag for carrying everything you need for the day, plus what you might buy along the way. This bag can actually be used as an overnight or weekend bag as well. Today handbags are not just a fashion statement and they are not just for practical purpose, the need to be both. And sometime, women carry more than one bag at the same time, especially those with a long day ahead and a need to be prepared for the office, the gym and a dinner party all by the time they leave the house in the morning. The variety of handbag and purse designs keeps getting bigger and more unique and interesting. Current rends are towards cloth and monogrammed bags. Dog bags have become poplar as we note many celebrities carrying their small dogs with hem at all times. 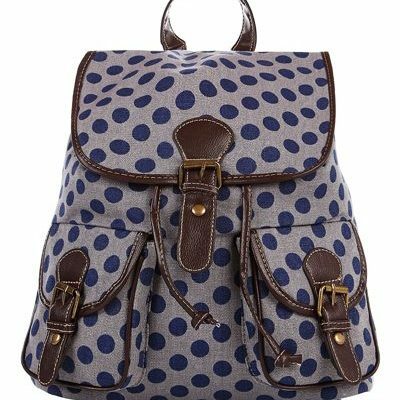 The recent trend is away from backpacks style and toward and oversized handbags. 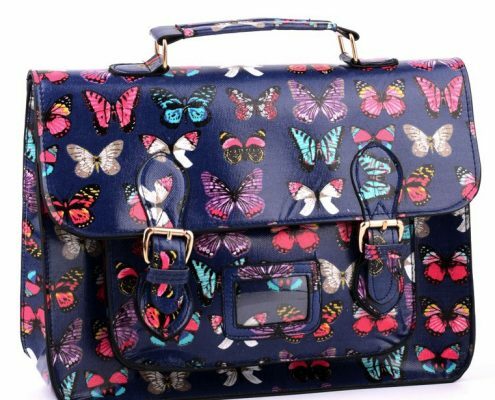 Women want a more fashionable handbag that can also be used as a as a briefcase, laptop case and handbag, and even baby bag. The bags are getting bigger and bigger to meet all of the needs, and carry all of the stuff. This means of course, that carrying a bag is getting more problematic as the bags get heavier. The toll on women’s back, neck and shoulders is a problem doctors and physical therapist are noting more often. Some of these medical professional warn of the effects of overloading the bags with heavy items and professionals are lobbying to have manufacturers place warning labels on the handbags. 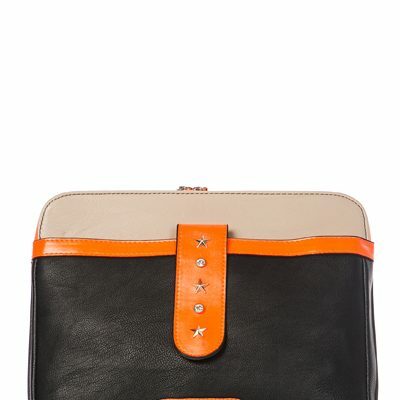 Handbags go back to the beginning of time and have become a practicality and a fashion statement for women of all ages. With suppliers of handbags has grown to include very high end and very low end markets, and copies of designers trends common place, everyone can find a handbag for them.